I assume you know your way visually around the major constellations and the brightest stars. In particular, for this lesson I assume you can find Albireo. You need a star-atlas going down to at least 6th magnitude (I recommend S&T’s Pocket Sky Atlas). You need a finder-scope or binoculars. 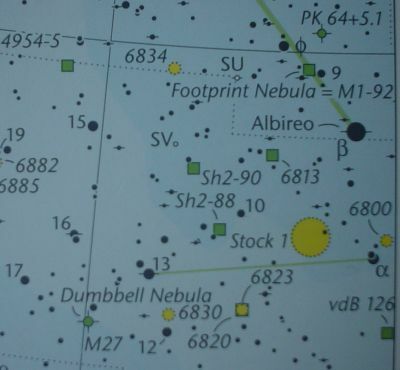 Looking at M27 in your star-atlas, you can see that Albireo is the natural starting point for this star-hop (see the figure below on the left). 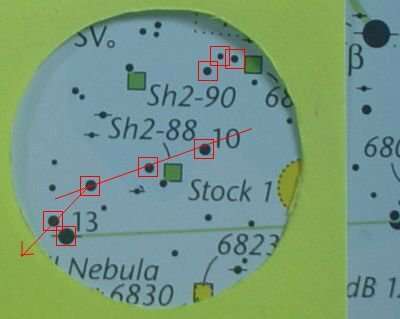 To plan the star-hop, you can see that there are three stars starting with 10 Vul that pretty much lie in a straight line. Those three stars point us to a pair of stars (one of which is 13 Vul), and not far from those you see another three stars in a line (connecting 12 and 17 Vul). M27 is just off the middle star of this second line of stars. There is another asterism shaped sort of like an ankh on its side that we can use to fine-tune M27’s exact position. The figure on the right highlights these patterns, which we will use to guide our star-hop. So begin by pointing your telescope at Albireo and centering it in the finder. You can confirm that you are pointed at Albireo by looking in the main telescope to see the beautiful gold-blue binary that is Albireo. 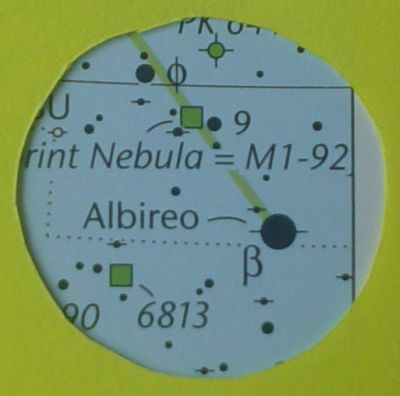 But even knowing that is indeed Albireo, as always we need to confirm orientation. In the finder you should see something like the figure below on the left. To confirm your orientation, look for φ and 9 Cyg (you can move your telescope towards Deneb to be sure that you have the right stars); also look for another relatively bright star to the south of Albireo forming a wide obtuse angle with Albireo at the vertex and φ and 9 Cyg on the other side. Roughly at a right angle with the line between 9 Cyg and Albireo, you can see a fainter pair of stars, and just past them a bit to the north is a distinctive arc of three stars. Those three stars point us towards 10 Vul and our line of three stars. These stars and patterns are highlighted in the figure on the right. Move your finder to towards the arc of three stars, staying a bit below them (“below” meaning on the “open bowl” side of the three stars). Keep moving the finder until the arc of three stars crosses your field of view and ends up near opposite edge of the finder’s field of view. 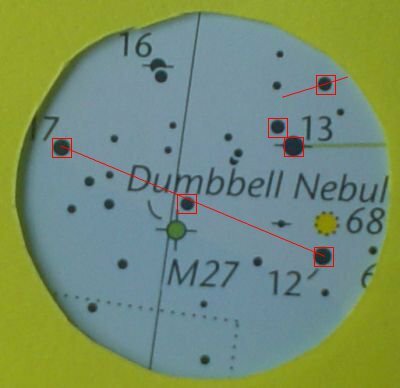 You should now see a line of three stars going across your finder’s field of view, as shown in the figure below. The first of those three stars in a line (the one closest to the arc of three star we started from) is 10 Vul. This line of three stars is the initial line that we identified in our star-hopping plan. We now will now prepare to move to the second line of three stars. At at the leading edge just entering the finder’s field of view you should see a pair of stars (13 Vul is one of the two stars in the pair) oriented roughly but not quite perpendicularly to the line of three stars. 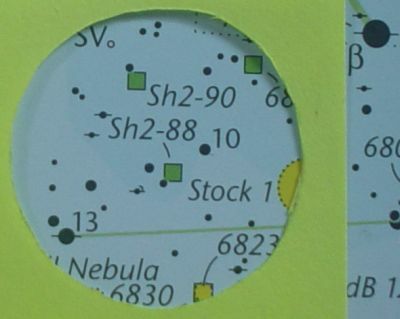 This pair and the line of three stars are highlighted in the figure below. This pair guides us on to the second line of three stars. To get there, follow the imaginary line from the final of the three stars to the top-most star of the pair, and continue on in that direction as indicated in the figure below. The direction we are following leads us to the middle star of the second line of three stars (connecting 12 and 17 Vul); see the figure below left (indicating the path from step 3) and below right (showing the key star patterns). Once again you should have a set of three relatively prominent stars in a straight line across your finder’s field of view. If you then point your telescope just past the middle star, you should find M27 in your main telescope’s field-of-view. M27 is relatively bright and shows up well even in light-polluted skies, so you should have no trouble finding it. But you can point your telescope even more precisely. To point your telescope very precisely, notice the “ankh-like” pattern the middle star makes with five other fainter stars. I’ve highlighted the pattern in the figure below. If you point your telescope just slightly below the cross-piece on the ankh (were “below” means away from the “loop” of the ankh), you’ll be pointing directly at M27. As in lesson one, if you don’t see M27 in your main telescope's eyepiece (and I would be surprised if you don’t), note the star-field you see through the main telescope and very gently sweep left, right, up, and down, always going a little ways in one direction and then back-tracking to return to your original star-field. You shouldn’t have to go more than one eyepiece field-of-view away. Always sweep away from your starting spot very carefully, return each time to where you started. Otherwise, you’ll soon wander far away and you’ll have to re-start the star-hop. So that completes the second star-hop lesson. This time you did a star-hop that relies on stars you simply can’t see in washed-out skies. For the next lesson we'll undertake a longer star-hop that includes not only "star-hopping", but "star-skipping" as well. Assignment #1: Find M56 starting from Albireo (β Cyg). Assignment #2: Find M56 starting from γ Lyr (start from Vega if you can’t reliably see γ Lyr in your light-polluted skies). Assignment #3: Find M39 starting from Deneb (α Cyg). I prefer to go via 55, 59, 63, and 71 Cyg; you can also get there via 57, ξ, 68, and ρ Cyg.